A motorist is facing drunk driving charges after he crashed his truck off of Boston's Interstate 93 northbound and landed on the lower deck of the expressway. A driver whose truck sailed off the upper roadway of Interstate 93 and landed on the one below told NECN that while he escaped the harrowing caught-on-camera crash relatively unscathed, he's just relieved nobody else was hurt. 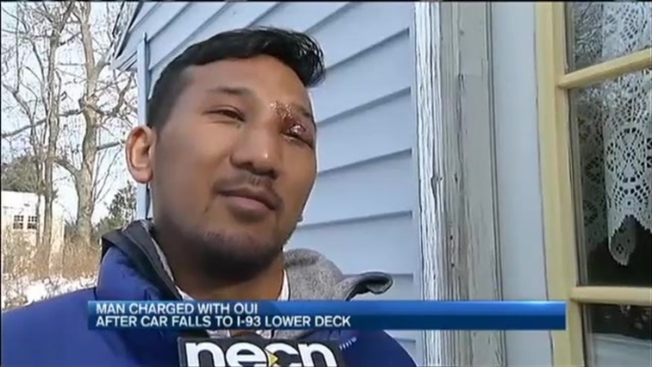 "I'm just glad I didn't hurt anybody else, you know," Vannak Sao, 33, of East Boston, told NECN. "Me, I'm fine — broken bones, bruised up, fractures, whatever — but if it happened to somebody else and I was the cause of it, that would be something else." Sao, 33, is facing drunk driving charges after he careened off the upper roadway of I-93 northbound in Boston and landed on the lower deck early Sunday morning. The dramatic crash was caught on breathtaking surveillance video footage. He said that before the crash, he had just left a friend's house, had had a little bit to drink and was tired. He told NECN he has been tired from working the third shift at his job and taking on extra hours shoveling. In the crash, Sao took out a light pole, an exit sign and several lengths of a chain link fence before he launched off the upper deck of I-93 around 6:25 a.m. Sunday, state police said. His truck came to a rest on the lower deck, the southbound side of Interstate 93. Sao was rescued from his truck and transported to Massachusetts General Hospital. He was summonsed to court on charges of operating under the influence and negligent operation of a motor vehicle following a brief investigation. State records show that Sao has had issues on the roads before, including speeding infractions and accidents. His license was revoked due Monday's crash. "Would I consider myself an irresponsible driver? No. Was I irresponsible the other night? Yeah," he acknowledged. It's unclear if slick road conditions contributed to the crash, police said. Sao said the roads were slick in spots but said he took responsibility for the crash and wouldn't blame it on the roads.